Last year, before I fell off the blog wagon, I published a blog post about my 2X Great Uncle, Will McCann . I never did get back to finish it, so I thought I should pick up where I left off. 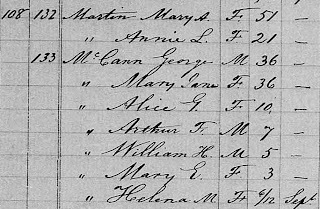 According to the 1901 census, William Henry McCann was born in October 17, 1867. Will was the third child, and second son of George William and Mary Jane (Martin) McCann. His death certificate says he was born two years earlier in Newport, Nova Scotia. However, I haven't yet found a church record to confirm which of those dates is accurate. Familysearch.org has a record for his birth citing the 1865 date, but I haven't yet figured out where their record can be found. If I do, perhaps I can find his parents' marriage record and births of his siblings. More research is needed to determine the location of the residences in each census. By the time the 1871 census was taken, Will's family had moved to Windsor. He was enumerated along with his parents, 1 brother and three sisters. His age was given as 5 which would agree with the October 1865 birthdate. 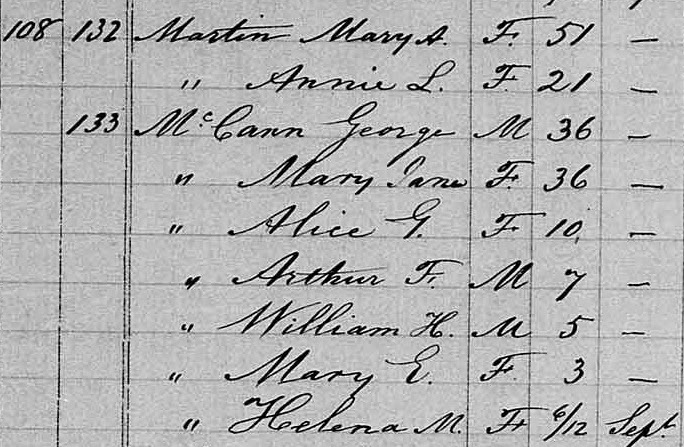 According to the census, Will's maternal grandmother, Mary Martin and his great aunt, Annie, share a dwelling with them. The following year on Christmas Day, Annie would marry Edward Stockall, an engine driver with the Intercolonial Railway in Halifax. I'm sure this would have influenced Will's employment path later in his life. By the 1881 census, Will, age 15, is still living with his parents and siblings in Windsor. There is no occupation listed for him and he is not going to school. His father, George's, occupation is Farmer so perhaps he was helping his father at home. Annie is married and living in Halifax. Will's grandmother, Mary, is living with Annie, her husband and three children. When 1891 rolled around, Will seems to be working as a blacksmith and boarding with a John and Annie Brenton in the north end of Halifax. He was also enumerated with his family in Windsor. Perhaps his parents weren't sure if he'd be staying in Halifax and included him as still living with them. I have no proof that "my" Will is the Will in Halifax, but the age is about right and his occupation is one that "my" Will continued for many years. After the turn of the century, the census shows Will working as a blacksmith for the Intercolonial Railway. He has been employed for 12 months and has earned $700. Will is boarding with his Great Aunt Annie and her husband, Edward, and their two grown daughters in Halifax. Edward is now a foreman for the same railway. Stay tuned for Part II of a glimpse into Will's life - from his marriage to Ida Roast, their experience with the Halifax Explosion and Will's career, to his death and burial in 1934.